NEW DELHI — Thousands of bullet-riddled bodies are buried in dozens of unmarked graves across Kashmir, a state human rights commission inquiry has concluded, many of them likely to be those of civilians who disappeared more than a decade ago in a brutal insurgency. The inquiry, the result of three years of investigative work by senior police officers working for the Jammu and Kashmir State Human Rights Commission, brings the first official acknowledgment that civilians might have been buried in mass graves in Kashmir, a region claimed by both India and Pakistan where insurgents waged a bloody battle for independence in the early 1990s. The report sheds new light on a grim chapter in the history of the troubled region and confirms a 2008 report by a Kashmiri human rights organization that found hundreds of bodies buried in the Kashmir Valley. Tens of thousands of people died in the insurgency, which began in 1989 and was partly fueled by weapons, cash and training from Pakistan. According to the report, the bodies of hundreds of men described as unidentified militants were buried in unmarked graves. But of the more than 2,000 bodies, 574 were identified as local residents. “There is every probability that these unidentified dead bodies buried in various unmarked graves at 38 places of North Kashmir may contain the dead bodies of enforced disappearances,” the report said. The report catalogs 2,156 bodies found in graves in four districts of Kashmir that had been at the heart of the insurgency. It called for a thorough inquiry and a collection of DNA evidence to identify the dead, and, for the future, proper identification of anyone killed by security forces in Kashmir to avoid abuse of special laws shielding the military from prosecution there. Thousands of people, mostly young men, have disappeared in Kashmir. 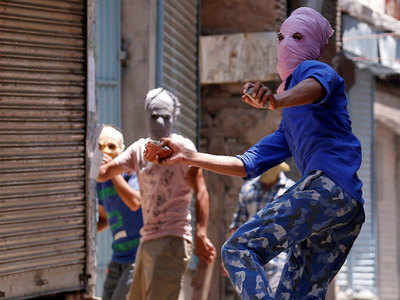 Some went to be trained as militants in the Pakistan-controlled portion of Kashmir and were killed in the fighting. Many others were detained by Indian security forces. The wives they left behind are known as half-widows, because the fates of their husbands are unknown. Parents keep vigil for sons who were arrested two decades ago. Parveena Ahanger’s son Javed was taken away by the police on Aug. 18, 1990, and never seen again. An investigation found that he had been killed by security forces, but they have not been prosecuted, she said. After years of fighting in the courts to find out what happened to Javed, Ms. Ahanger was skeptical that the human rights report would get her son’s body back, or bring her justice. “If the high court doesn’t give any justice on this issue, what will the state human rights commission do?” she said. Zahoor Wani, an activist who works with the families of people who disappeared during the insurgency, said that the report was a welcome first step but that the government must identify the dead and allow families to bury their relatives. “It is a very good thing that they acknowledge it,” Mr. Wani said. “These families have been living in a hope to see these people again.